From the moment you find out you’re pregnant, you start visualizing and dreaming about what life will be like once baby makes 3. You begin preparing for where your baby will sleep, eat, be changed and even where she’ll play. Almost immediately the to-do list becomes a mile long. McCort suggests you start preparing your pooch the minute you find out you’re pregnant. Don’t wait until something’s gone wrong. He offers 5 tips to prepare your pup for the impending arrival of your real baby. 1. Socialize your dog with kids. Spend the next 9 months slowly introducing your dog to children. Take him to dog parks, over to homes of family and friends or any other place with babies or young kids. Getting your dog around children teaches him that they are safe, and gets him used to the sights, sounds and smells of babies. Start out at a distance to make sure your dog is comfortable and isn’t showing any signs of aggressive behavior. When your dog acts positively toward a child, heavily reward that behavior. 2. Nip behavioral issues in the bud. Behavior that might seem innocuous now, such as jumping up to greet you at the door, can pose an issue once your baby arrives. Consider taking your dog to obedience training to teach him some basic cues, like sit, stay, down or drop (as in drop the diaper). 3. Actively prep your pup using a baby doll. Anything you can do now to help reduce your dog’s anxieties once the baby comes home is beneficial for everyone. Rock, sing and stroll a baby doll around your house to get your dog used to daily baby care. Also, set up your baby swing, crib and other essential gear so he becomes familiar with these items now, instead of introducing them once the baby’s in them. In addition, use a CD or other recording to get your dog used to sudden loud noises and a baby’s cry. 4. Initiate changes now to his new schedule or rules. Dogs thrive on predictability, so rather than an abrupt change once your baby arrives, ease him into the new schedule and rules a few weeks before your due date. Set up your baby gates now to get him used to his new boundaries around the house. Also, there may be fewer long walks and he won’t get as much attention once your bundle of joy arrives, so start easing him into that now. 5. Make arrangements for dog care ahead of time. Unless you’re having a scheduled c-section, the birth of your baby can be unpredictable. A few weeks before your due date, have written instructions for feeding, walking and caring for your dog in a prominent spot in case you have to rush out the door. Once you bring baby home, there’s still work to do to prep your pup for a smooth transition. One big mistake people make is when the baby is awake and parents are interacting with her, whether feeding or changing her, the dog is confined or ignored. Then, once the baby goes down for a nap, parents play with the dog creating competition unbeknownst to them. 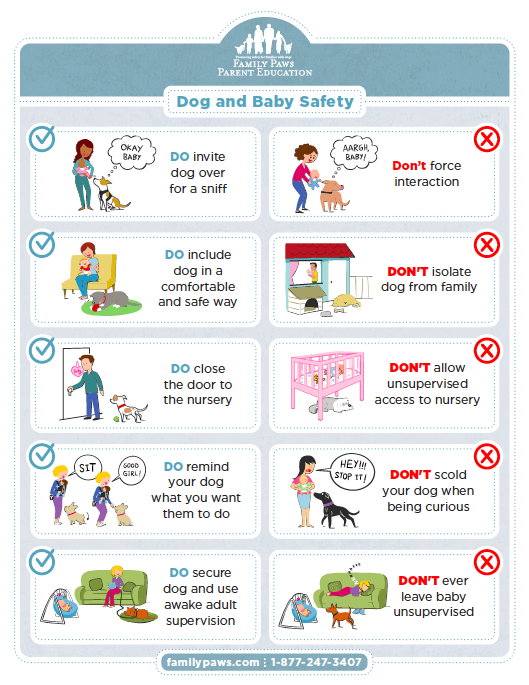 Follow these 5 dos and don’ts from Family Paws Parent Education to keep your dog and baby safe. If you suspect there’s a problem, consult a canine professional that is referred by your veterinarian.